An animal lover throughout childhood, Sybil worked as a veterinary assistant while in high school and then at a dog training facility during her college years. In 2006, she decided she wanted to adopt a Bernese Mountain Dog and found her Boris, abandoned and miserably hot in a Florida shelter. Then, in 2010, she learned about the huge need for puppy fosters and the idea of being able to love on and play with puppies whenever she wanted sounded like great fun and a wonderful way to support rescue! Sybil spent the next couple of years volunteering with different rescues, learning what she liked and didn’t like about their practices. 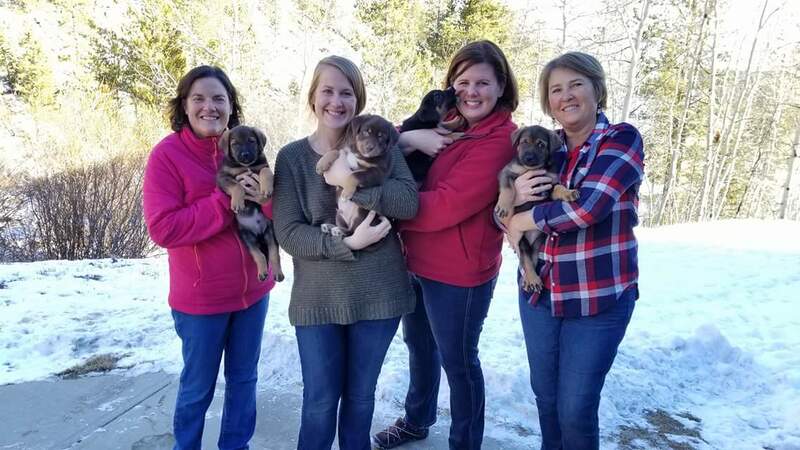 As a successful business owner, Sybil had developed the skills and contacts to start a non-profit organization so she gathered the support needed and founded Mountain Pet Rescue. She is forever grateful for the generosity of MPR’s legal/accounting professionals, administrative assistants, veterinarians, dog trainers, fosters and volunteers who have helped save and rehome over 2000 dogs in 6 years! It was Emily’s love for animals that brought her to Mountain Pet Rescue. From the moment she joined this wonderful team of hard working volunteers, her eyes were opened to a whole new world of rescue! With her Bachelors of Animal Science and years of experience in administrative duties, Emily was ecstatic to have the opportunity to become MPR’s invaluable Executive Assistant. Having adopted two dogs of her own, Emily instantly fell in love with the mission of MPR and the goal of ensuring each dog finds their perfect forever home and that each adopter is provided with the tools to guarantee a successful adoption! She has a true appreciation for MPR’s dedicated team of volunteers and hopes she can contribute to the expansion of our organization to continue saving dogs in danger for years to come. Jamie began following Mountain Pet Rescue on Facebook in late 2013 to smile over the new family photos as dogs found homes and giggle over the cute puppy videos. Also in those Facebook posts were requests for fosters and volunteers. After months of scrolling past those and hoping “someone does something”, in April of 2014 Jamie saw the eyes of Sara in Texas. Relinquished by her family to an overcrowded shelter that euthanized owner surrenders for space, Sara was on death row pleading for her someone. Jamie was on the phone with MPR volunteering to foster even before she told her (incredibly patient and supportive!!) husband, Mike, that they were about to become fosters. After quickly realizing Sara from Texas, temporary foster, was actually perfectly happy in her new forever home and not going anywhere, thank you very much, Jamie looked for other ways to continue helping MPR. The more Jamie got to know MPR and how they worked, the more she believed in the vision and the more she wanted to do. It was a great opportunity to combine her business degree and over twenty years in finance with her love of dogs. As a result, you can often find Jamie alongside a plane or outside a van helping welcome dogs to Colorado or helping process applications or moving supplies to fosters around the Front Range while promising Mike that someday, maybe, his backyard shed will again be his and not full of dog supplies. Until that happens, Jamie and the ever-patient Mike will continue the hard work and the sometimes heartache that is involved in rescue because it is all worth it to see love at first sight in action and to know that, in some small way, they made a difference that day. Susan found Mountain Pet Rescue through a Facebook post on a friend’s page and would casually read the posts about dogs in need and dogs finding their forever families. One Saturday morning in 2012, the first post to appear in Susan’s Facebook feed was a plea for emergency, temporary fosters. After confirming with her family that “we can do this”, Susan completed a foster application and received two puppies that evening. Each was adopted a few days later, and Susan and her family decided “we can do this again”. Those words led to a long line of fosters (166 and counting!) to spend at least one night with Susan and her family. Picking up their foster pups at transport became a fun activity for Susan’s family, and before long, Susan and her high school aged daughter were acting as volunteers at transport arrivals – welcoming the dogs/puppies to Colorado and their new lives, helping facilitate the introduction to waiting adoptive and foster families, and making sure the foster families had the needed supplies. Susan joined the MPR Board in April of 2013, serving in a variety of ways. Susan’s years of non-profit leadership, combined with her love of animals and her desire to see every dog in a loving home make this a natural fit.